Apple Music is available on your Mac. Streaming Internet radio stations have their place and are great. But Apple (like many of its industry rivals) curates its own streaming radio stations for your listening pleasure. The result is the radio portion of the Apple Music service, which you can get to by clicking the Radio tab in iTunes. You’ll land in an environment like this one. Customize Apple Music to choose the kind of music you want to hear. As part of Apple Music, anyone using a Mac (or for that matter portable devices from Apple and Android) can tap into deejay-hosted Beats 1, a global 24-by-7 radio station broadcast live from studios in Los Angeles, New York, and London. The other Apple Music radio stations, and the benefits that come with them, are reserved for people who subscribe to Apple Music. The cost is $9.99 a month for an individual or $14.99 a month for a family membership that covers up to six people. If you aren’t sure Apple Music is for you — and although it’s great, there are other fine music subscription services are out there, including Spotify — sample it for three months under a free trial. 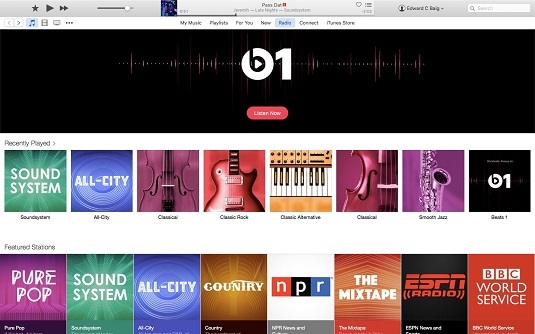 Apple Music membership benefits include a bunch of genre-focused curated Apple Music radio stations. And if you hear music from these stations that tickles your fancy, click the heart to train the service into serving up more songs just like it. You can also click the three dots next to the song title (when you hover the cursor over it) for other drop-down menu choices. For example, you can add the song to your My Music collection. You can add the song to a playlist or an iTunes wish list. You can share the song or station (via email, Twitter, Facebook, and Messages), or jump to the particular artist or album to explore other music from that performer. And you can use the song in question as the seed song that blossoms into its own custom radio station. Songs with explicit lyrics are shown with a tiny E next to their title to ward off you (or perhaps your kids). Speaking of material that you or your children may not want to hear, if you are turned off by vulgar words or other potentially sensitive or scatological lyrics, head to iTunes Preferences, click the Restrictions tab, and place a check mark next to the Restrict: Music with Explicit Content option. The various tabs at the top of your iTunes display hint at other sections of Apple Music. Click New to peek at Hot Tracks, Hit Songs, and other new music that Apple wants to bring to your attention. Click For You for recommended playlists and albums that the Apple Music editors think you’ll like, based on your current collection and the songs you choose to buy or designate as favorites. The For You section is frequently updated to keep the material fresh. Click Connect to follow certain artists and learn about new releases and tours, view candid photos, and even watch some video. You can read what fans of the artist have to say about the performer and contribute your own comments. You’ve probably figured out by now that the My Music tab leads to your own iTunes music collection or library. If you subscribe to Apple Music, you can add the music you hear streaming on the radio to your collection. As a subscriber, you can also stream any song in the vast Apple Music collection that you want to hear and add that song to My Music too. Of course, there is a great big catch here: If you no longer subscribe to Apple Music, you won’t be able to play back any of the music that you don’t outright own.